In Buddhism, anicca (impermanence) is seen as the first of three marks of existence and the idea that existence is by nature, evanescent and inconstant. With his new show, Anicca, composer and performer Matthias Schack-Arnott manages to bring these beliefs into the thoughts of his audience as we reflect and ponder on the transient nature of not only moments in our lives, but of life itself. 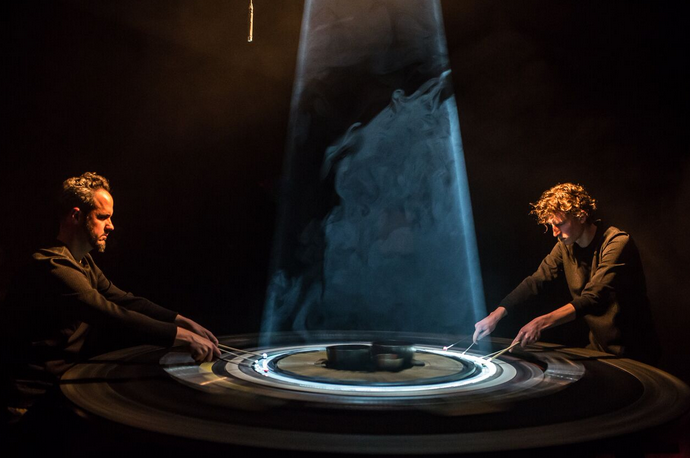 While his previous show, Fluvial had its own impressive concept and visual design, Schack-Arnott has truly outdone himself with the design of the instrument for this performance. An array of bamboo sticks, pebbles, shells, felt and other tactile items are glued on to a flat round surface and with the use of a motor from an electric pottery wheel, Schack-Arnott gets the instrument spinning, where it begins to resemble a large roulette wheel. This variable-speed rotating instrument created with engineer Richard Allen, has no name and this adds to the mystery and wonder of the show. Schack-Arnott teams up with Eugene Ughetti for this performance to use cymbals and bamboo sticks to scrape, strike and interact with the objects on the spinning wheel. Even though they are on stage together and using the same instrument, Anicca could almost be described as a solo performance with two performers. They may be occupying the same space yet there is little acknowledgement of each other, reminding you of the singular journey we are on. Through their precision timing and expert speed, Schack-Arnott and Ughetti create music that quickly fades in and out, disappears or suddenly changes into something completely different. The exceptional lighting work by Richard Dinnen similarly creates an ever-changing environment where nothing is constant and at times, where the performers are shrouded in darkness and mystery. Schack-Arnott continues to build on his reputation as a musician and composer who is not afraid to experiment with what music can be, as well as what it can make people feel. Anicca is an incredibly thoughtful and inspiring piece of music that creates an opportunity for audiences to open themselves up, be vulnerable and to consider and embrace the fleetingness that is life. * Original review appeared on Theatre Press on 4 November.